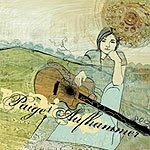 Possessed of a confidence and presence belying her young years, Encinitas' Paige Aufhammer's debut CD is a polished, melodic collection of folk and folk-rock songs likely to stick in your head (and CD player) for a long while. In fact, Aufhammer would seem to have all the ingredients necessary for national success  hook-filled songs she writes herself, lovely voice, attractive looks, savvy marketing campaign. Of course, that first ingredient  the songs  is the key one. Her self-titled CD, though, shows she has no worries on that score. There are at least three songs that would be Top 40 hits in a world where talent ruled the day: "Mad Man's Machine," "Oh, Love" and "Out of Time." Hits or not, they're likely to be mainstays of her playlist for years. The production and arrangements are also top-notch: immediately accessible enough to draw you in, complex enough to keep you coming back for another listen. With strings on some tracks, and a stellar roster that includes San Diego icon Rob Whitlock on keyboards, this has the full sound of a major label release  the fact that Aufhammer has the songs to take advantage of that production makes it a CD worth getting ahold of.